Human Body Eyes Activity Sheet – Download this fun & FREE printable easy science activity sheet hidden words game about human eyes. This fun easy science activity sheet includes a fun hidden and missing words game as well as a find the words seek puzzle. Our printable science activity sheet is ideal for Pre-K kids, Kindergarten kids & Grammar school kids in Grades 1-5. Grammar & Primary school kids can use this fun science activity sheet as a reading comprehension worksheet while learning fun facts about the human eyes. Younger kids who cannot yet red nor write, can enjoy this easy science hidden words game as a listening comprehension activity sheet while learning fun facts about the eye. Our fun FREE hidden words games and word seek puzzles for kids are a great way to awaken their interest in science and gain their attention while teaching them fun easy science facts. Teachers can use our free easy science printables worksheets to supplement their science classes, for school enrichment programs and for after school enrichment programs. Parents can use our free downloadable easy science activity sheet to spend quality time with their kids or for homeschooling kids. Our fun facts about science website for kids offers many FREE to download and print worksheets, easy science activity sheets and hidden words game puzzles for kids. How do the human eyes function? Your eyes main function is to see the world. Your sense of sight makes you appreciate the color and the beauty of things around you. A person is lucky to have healthy organs for sight. Eyes are very sensitive, that one must take extra care of them. Sunlight and a lot of outdoor activity will keep your eyes healthy. [sociallocker]Download FREE hidden words game activity sheet about the human eyes. 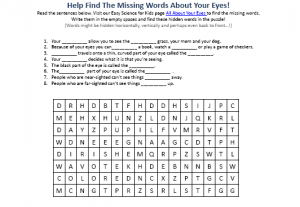 Download the FREE Eyes Hidden Words Game Activity Sheet for Kids! Did you enjoy the FREE Eye Worksheet? Read lengthy information about the human eye here. Declan, Tobin. " Eyes - Free Printable Easy Science Activity Sheet Hidden Words Game - ." Easy Science for Kids, Apr 2019. Web. 25 Apr 2019. < https://easyscienceforkids.com/eyes-free-printable-easy-science-activity-sheet-hidden-words-game/ >.